Who needs pants? We definitely don’t! On a gorgeous and warm Sunday, January 12, 2014 over 500 people rode the Phoenix area light rail for the 6th Annual No Pants Light Rail Ride. We started at light rail stops all over the valley with a shared destination of Central Avenue and Roosevelt Street. From there, the group walked to Angel’s Trumpet Ale House to have a beverage, share stories from their respective legs of the ride, and take photos. The West Side ride started with a hiccup when a light rail security guard tried to tell the photographers in the group that they could not take pictures on the light rail. Thankfully we had a few legal eagles in our group who were able to explain the law to him that photography is permitted as long as it does not disrupt the light rail itself, which was confirmed by his supervisor. Our group filled multiple trains. Some panted passengers joyfully joined in our fun. Others looked at our bare legs with shock and confusion. One couple boarded the light rail at the airport stop and was so engrossed in their conversation and their phones that it took them two stops to realize that the majority of people around them were in their underwear. On another train, a family was traveling with small children. When the father saw the pantless group board the train, he sternly told his kids to close their eyes. At one of the platforms, a German tourist requested pictures with several pantless riders and asked if public pantlessness was normal given Arizona’s conservative reputation. Of course the media showed up. The cool ones took their pants off and joined in the fun. Some of our organizers tried to shame the photographers from the Arizona Republic into taking their pants, but to no avail. One of our organizers and one of our photographers were interviewed by Fox 10 prior to the ride and made it on the local news. This event was started by Improv Everywhere in New York in 2002 and it has since become a global phenomenon. People in 60 cities and 25 countries participated in this year’s event, including Phoenix. 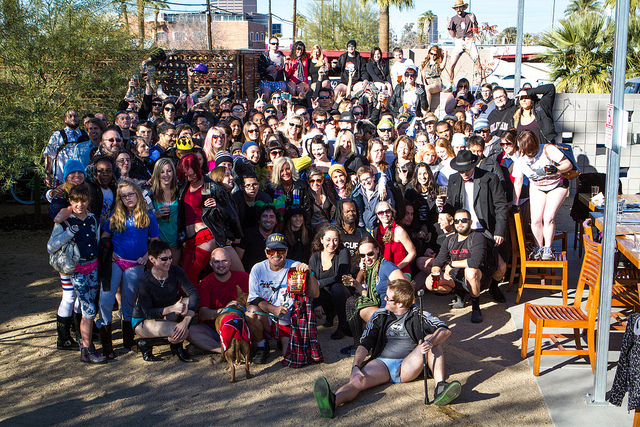 You can see some of the photos from the No Pants Rides in other cities on Mashable. Thank you to everyone who came out and joined us for this year’s No Pants Light Rail Ride, and thank you to Angel’s Trumpet Ale House for hosting us. Please share your photos on the event page. Our photographers have started posting their photos from the event on Flickr and will continue to add more as they process all their footage. 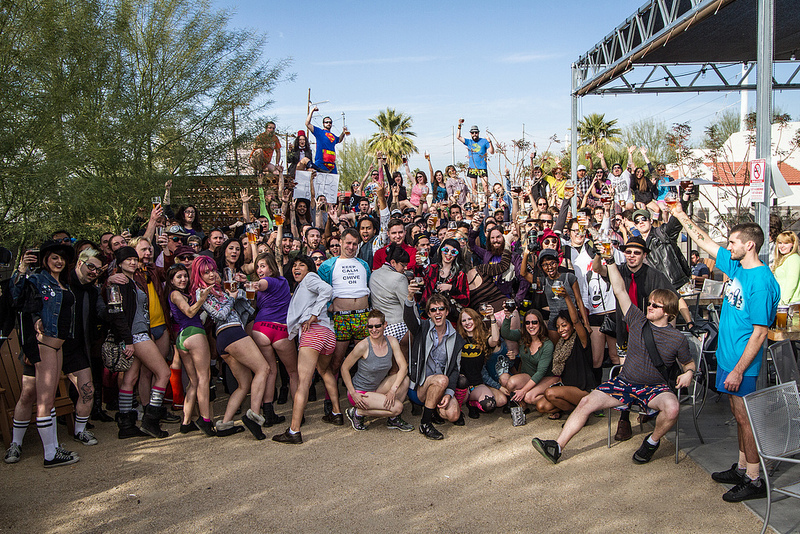 No Pants Light Rail Ride 2014 – All the info! The 6th Annual No Pants Light Rail Ride is coming up on Sunday, January 12th. This event is part of the International No Pants Subway Ride started by Improv Everywhere. On this day, tens of thousands of people will be riding their public transportation without their pants. We expected hundreds of people to participate in the Phoenix ride. It’s going to be a ton of fun – we hope you can join us. Where: Start at any Park & Ride location along the Light Rail – details below. You can wear almost any type of underwear you want – except thongs or g-strings. If you’re going to wear boxers we encourage you to wear briefs underneath them in case your fly separates. You can get in trouble for indecent exposure if you reveal too much! Do NOT tell people you are doing a prank! While you’re riding, act as if nothing strange is going on. Do what you’d normally do on the light rail – listen to your iPhone, read a book, etc. You have no idea why others are not wearing pants. If anyone asks, have a simple excuse prepared for why you’re not wearing pants – you were hot, you forgot them, etc. We’re changing things up this year, and rather than have everyone start at just two locations, you can start at any Park & Ride location you wish! Just go to one of the Light Rail stops listed below, and board the first train that arrives after the time listed. We’re all headed to the same place, so don’t worry if you get on a different train than other people. We’re trying to spread out the fun! Make sure you arrive in time to get a Light Rail pass from one of the machines at the stations! If this is your first year doing it and you want to be at a station with someone from ImprovAZ, go to the 19th Ave & Montebello or Price/101 & Apache locations, but really you can start anywhere! Everyone exit the train at the Central and Roosevelt Station. Our mid-ride party will be at Angels Trumpet Ale House. They will have some specials for us if you want to grab a bite or a pint. This is an all-ages place, so minors are welcome. We’ll stay here for about an hour or so, but you are free to leave early if you need to, or stay later if you’re having fun. It will be about a 5 minute walk from the Roosevelt station, so bring those (temporary) pants if you need them (see above). Here’s a handy No Pants Google Map of all the starting locations, the exit location, and how to find Angels Trumpet Ale House. And you can print out this cheat sheet of where the stops are and other basic info to take with you on the ride. Make sure you RSVP for the Facebook Event – that’s where we will post any last minute updates, and information as we’re going along! Ask away either here or on Facebook! No Pants 2013 Recap – The temperature dropped, and so did our trousers! The overnight freeze warnings did not deter our 350+ participants from dropping their pants at the 5th annual No Pants Light Rail Ride. This event is part of the Global No Pants Subway Ride, which was started by Improv Everywhere in 2002. A balanced mix of newbies and veteran pantsless riders braved the cold and started the ride from three different locations. This was the first year we had groups switch trains mid-ride. Every time a group disembarked and boarded a new train, they ended up on a train with another group of pantsless people from our group – talk about awesome timing! We had our usual reactions from people who were shocked and surprised by the display of legs around them. Our group did an excellent job of maintaining the front that we weren’t part of a larger event but that it was just a coincidence we all forgot to put on pants that day. There were a few pantsed people who were frustrated that they couldn’t figure out what was going on, and some even made disparaging remarks to our groups’ captains. They didn’t understand that nothing they could say would make us put on pants or feel bad about rocking our undies in public! We also had at least five people who didn’t start the ride with the group drop their pants and join in the fun. We love growing the group as we roll across town. One interesting thing to note – the group that started from the west side encountered light rail security at back-to-back stops. They said they were there to do random ticket checks, but we’re pretty sure they wanted to check out everyone’s underwear. After all the riding and changing trains, our group met up at Angels Trumpet Ale House, a great place in Phoenix for craft beer and having fun. We had a blast mingling, sharing stories, and taking pictures for over an hour before dispersing. Some people stayed at Angels Trumpet while others moved on to other downtown establishments and the rest of us hopped back on the rail and headed for home. 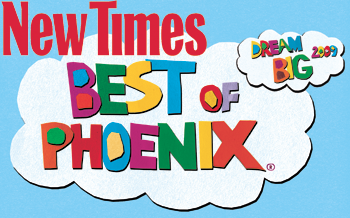 Kudos to the photographers from Phoenix New Times, College Times and AZ Central who dropped their pants and were not obtrusive in their coverage like we ask (check out their photos!). Sadly, other news outlets weren’t quite so considerate, and seemed a little surprised when we told them to get lost. You’ve got a whole year before next time to get some nice underwear and more discrete cameras, guys – get on it! Behold, the most excellent video from the ride! Thanks to everyone who helped make this event a huge success and a special thank you to Angels Trumpet Ale House for hosting us. Please check out the photos from the 2013 No Pants Light Rail Ride on Flickr and subscribe to our YouTube channel so you get videos on future pranks and flash mobs. If you want to stay in the loop about our future shenanigans, including our secret flash mobs and pranks, be sure to subscribe to our newsletter.